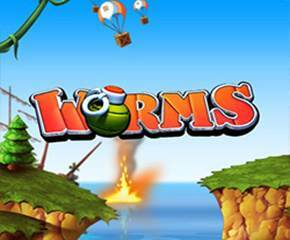 Worms is a cartoon style themed slot based on popular PC game of the 90’s. These are no ordinary creatures but war heroes that fight the pirates off the coast with deadly weapons. This is a five reel slot with fifty large active win lines. The game is set in the backdrop of battle struck sea with a navy ship and a pirate ship. You can also see some heavy-duty cannons and explosion in the sea. Some worm characters along with crates can be seen landing with parachutes. You can hear military music in the background during the spins that adds more glory to the game. The betting starts with £0.50 and maximum is £250 per spin. This colourful cartoon style slot game was developed by BluePrint gaming. They are one of the leading online casino slots development companies with hundreds of popular games. All their games support devices such as iPhone, iPad and other smartphones. Visually, the game looks like a funny cartoon show with high-definition graphics. You can find symbols of four different worms holding weapons in their hands. The big teeth worm and a group of worm characters pay the highest with five times on your total bet. This is given when five of a kind appears across a winning line. Ace through to the 9 of playing cards are the ones that pays the least. There are just a couple of bonus symbols here to help you win some additional rewards. They are the symbols of a crate and scared worm with hands up in the air. Wild Bonus: The scared little worm is the wild feature of worms game and it replaces all except the crate symbol. Wild can appear fully stacked on all reels and you get 1000 times your bet when that happens. Bonus Crate Symbol: When three or more of these symbols appear anywhere on the reels during a spin, a bonus level is triggered. There are three crates that appear and you must pick one. It can reveal unlimited free spins, a trail bonus with up to 1000 times your bet and escape bonus with up to 100 times on your total bet. 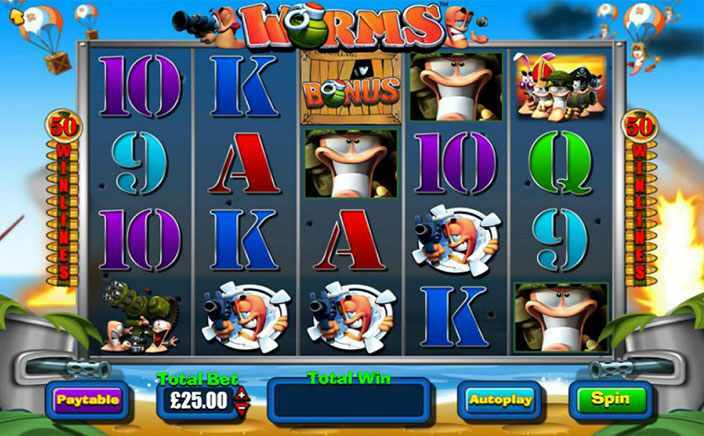 Summary: Worms is an innovative cartoon style slot game with a wide range of bonus features. The RTP in this game is 94.26% which is fair enough for a slot like this.